The US Leicester Longwool Sheep Breeders Association was founded to preserve and conserve the endangered Leicester Longwool breed and to promote the interests of Leicester Longwool sheep breeders. The philosophy of genetic conservation is based on the desire to maintain the current stock as purebred. Different breeds were developed for different purposes. Keeping a variety of breeds is the best way to ensure that the qualities that we may need remain available. A rare breed should not be forced to meet current fashionable standards but should be promoted for its own unique and irreplaceable characteristics. The conservation of a rare breed is not only for preservation but for the possible future utilization of its unique characteristics. The fleece of the Leicester Longwool is prized by hand spinners and crafters for its curl, soft handle, and lustrous beauty. The fleece generally weighs from 11-18 pounds, although heavier fleeces have been recorded. The wool has an evenness of length with a spiral tipped staple length of up to 14 inches in twelve months growth. The wool dyes exceptionally well, maintaining the purity of color; the natural luster still shines through. This premium wool is very versatile, working well for combing for worsted products, carding for woolen products, and felting projects. The Leicester can be shorn twice per year. The Leicester Longwool is a medium to large polled breed with a high quality carcass, whose poll is well covered with locks of wool. Mature rams weigh 200-300 pounds and ewes weigh 150-200 pounds. The breed is white and natural in color. The Leicester Longwool ram is an excellent sire and when crossed with other breeds will stamp their well known qualities of feed efficiency and heavy lustrous fleece on the offspring. The Leicester Longwool ewe is a very good mother with exceptional longevity and milk production. The breed is very docile and easy to handle. 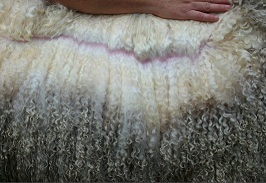 Leicester Longwools are known for their adaptability to live and thrive under a wide variety of conditions and climates. The fleece of the Leicester Longwool is very distinctive and a very important part of the breed.